ations working in Syria starting off its commitment to the UN General Assembly resolutions on strengthening the coordination of humanitarian emergency assistance of the United Nations and those which stress the necessity of respecting a state’s sovereignty, regional safety and national unity and not interfering in its internal affairs. Al-Jaafari was speaking at the UN General Assembly’s open session to discuss the agenda item 70 (a) on strengthening the coordination of humanitarian and disaster relief assistance of the United Nations, including special economic assistance. He stressed Syria’s deep belief in the importance of coordinating humanitarian efforts to convey humanitarian aid to the affected citizens in urgent circumstances in terms of the UN General Assembly resolution no 46/182 which outlines a framework for humanitarian assistance and a set of guiding principles for the work of the Office for the Coordination of Humanitarian Affairs (OCHA). He added that the Syrian government, throughout the current crisis, spared no efforts to provide urgent aid to its citizens and formed a committee to follow up on the humanitarian situation of the affected citizens whether to provide food and health aid, compensate for the damage caused by the armed terrorist groups’ acts or to rehabilitate the infrastructure to resume providing social and healthcare services. Al-Jaafari added that a higher committee for relief was formed in order to coordinate efforts exerted to help the affected people and 547 temporary makeshift shelters were opened as a result of the Syrian government’s hard work under these difficult circumstances. He pointed out that the Syrian government cooperated with the UN Office for Coordination of Humanitarian Affairs (OCHA), the Office of the Higher Commissioner for Refugees and the International Committee of Red Cross and provided all necessary facilitations to convey humanitarian aid to those who need them all over the Syrian territories. He added that the revised Syria Humanitarian Response Plan was implemented and the Syrian government granted licenses to more than 80 non-governmental organizations to contribute to the implementation of the response plan. Syria’s Permanent Representative to the UN stressed that the Syrian government will provide all facilitations to humanitarian workers and grant licenses to the OCHA for field visits to several areas in Syria without any delay. He indicated that Syria had a constructive participation in 6 meetings of the Humanitarian Forum held in Geneva and tackled the situation in Syria. Al-Jaafari pointed out that the government’s humanitarian efforts were hindered by several obstacles as the countries which are known for their support to the armed terrorism in Syria continued funding, arming and protecting armed terrorist groups in Syria. 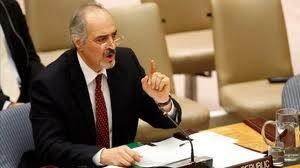 Al-Jaafari added that it is paradoxical that the issuance of 6 press statements to condemn terrorist bombings carried out by the al-Qaeda affiliated Jabhat al-Nusra were hindered at the UN Security Council after which one of those countries which hindered the statements puts this terrorist group on its national list of terrorist organizations. He went on to say that ” Since October 2011, Jabhat al-Nusra announced its responsibility for carrying out 600 attacks, including more than 40 suicide attacks and other attacks using weapons and explosive devices, in Damascus, Aleppo, Hama, Daraa, Homs, Idleb and in Deir Ezzor. He indicated that it took more than one year to admit the presence of what they call “the third part” a polite expression that replaces the armed terrorist groups and it needed other six months to move to the admission of the presence of armed groups and after three months of shedding more Syrian blood, they admitted the presence of terrorist groups linked to al-Qaeda. Al-Jaafari said that the Syrian people suffered 21 months of terrorism waiting for the UN and its member states to hear their suffering due to a systematic terrorism which, unfortunately, received Arab, regional and international support from the beginning. He added that the Syrian government’s full cooperation with the humanitarian Response Plan signed with the OCHA collided with the lack of funding which hinder joint efforts to implement the revised response plan to meet humanitarian needs. While the Syrian government is working hard to perform its role in meeting the humanitarian needs of its citizens, some of donators, who appeared in media and talked at international forums, did not commit to their obligations which has been clearly shown in the OCHA statements and reports, the latest of which was on December 11th which revealed that only half of the required funding for the humanitarian response inside Syria and 35% of funds to meet the needs of Syrian refugees have been received so far. He added that the OCHA report indicated that the World Food Program had to reduce the allocations because of the lack of funding which reflected on the implementation of the plan and the inability to meet the affected people’s needs and raised doubts about the keenness of some countries on the interest of the Syrian citizen. Al-Jaafari stressed that imposing a package of compulsory unilateral economic procedures by some influential countries and regional groups against Syria contributed to the deterioration of the Syrians’ livelihood and the decline in the possibility of providing citizens’ basic needs, in addition to hindering efforts to import medicine, medical instruments and required equipment to re-run public facilities. He added that the unilateral procedures caused a rise in exchange rate, a decline in the purchasing power of the Syrian pound, an increase in the inflation rate and difficulty in funding imports, in addition to stopping the funding of investment projects and the lack of financial resources which will increase the rate of unemployment and poverty. Al-Jaafari stressed that those who impose these procedures and claim to provide humanitarian are symbols for political hypocrisy and deception, adding that these countries aimed at turning the productive Syrian people who achieved an economic development and food sufficiency over the past few years into people who live on aid. He indicated that Syria called upon its people who were forced to leave their country to the neighboring countries to return to their houses and avoid being exploited by the terrorist groups and their supporters, adding that the Syrian government allocated aid to people whose houses were destroyed to rehabilitate them and go on in their lives. Al-Jaafari said that the Syrian people are the victim of continuing the bloodshed in Syria, referring to the terrorist bombing in front of a school in Qatana city in Damascus Countryside which claimed the lives of tens of children and their parents following eight other terrorist bombings which hit several areas in Damascus and killed scores of innocents. He pointed out to the negative impact of these terrorist acts on citizens’ livelihood with the aim of destabilizing the Syrian society and spreading panic and chaos among the citizens through attacking schools, hospitals, power plants, grain silos, fuel tanks and oil and gas pipelines.